Lifelike adult arm reproduction with replaceable skin and veins designed for peripheral intravenous therapy. Venipuncture possible in the antecubital fossa or dorsum of the hand. Peripheral IV line insertion and removal. Palpable veins enable site selection and preparation. Infusible veins allow peripheral therapy with IV bolus or push injection method. Peripheral IV line maintenance, including assessment and rotation of site and dressing, solution and tubing change. Replaceable skin and veins ensure longevity of model. 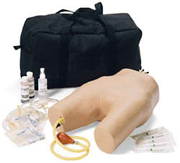 Kit includes: adult male arm, replacement skin and vein set, simulated blood, blood bag with tubing and connector, clamp and hook, five syringes, manikin lubricant, and carrying case. 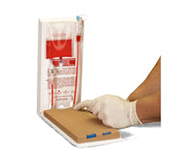 Made with Dermalike™, this advanced four-vein training aid provides practice for the injection of fluids and the drawing of blood on a large 12" x 5-1/4" x 1-1/4" model. Permits increased difficulty and improved skills using three different sized, barely discernable blue veins, placed at varying depths in a semi-transparent, tissue-like material. When accessing, the skin rolls as the vein is palpated and a "pop" is felt as the needle enters the vein. An excellent model to practice the mechanics of the new "no stick" IV catheters. The unique design allows for quick, easy set-up. This lightweight, easily transportable, economical, and nonstaining training aid is a great alternative to larger, heavier, and more expensive models. Made with a soft vinyl skin over a core of stitchable foam to provide a lifelike suturing experience for students or a realistic suturing demonstration by an instructor. Realistic skin texture with wrinkles, pores, and visible fingerprints. Soft and pliable for easy sewing, the skin is tough enough that sutures will not pull out when tightened. The unit is provided with three “wounds.” These “wounds” can be sutured repeatedly until the skin around them is finally worn out; then, new “wounds” can be cut. Although disposable, the arm provides hundreds of suturing experiences before wearing out. Conservatively, over one hundred cuts can be made on the trainer and each of these cuts can be sutured several times. Comes complete with a starter package of sutures and instruction booklet. Three-year warranty. Combines all features required for IV, IM, and sub-Q training in one challenging simulator. Features: arm rotates 180° at deltoid region; subtle venous network in arm and hand; cephalic, basilic, antecubital, radial, and ulnar veins; realistic "pop" as needle enters vein; intramuscular injection site in deltoid area; subcutaneous injection areas on the volar side of the forearm and the lateral side of the upper arm; squeeze bulb to increase or decrease venous pressure; veins stand out or collapse; easily replaceable skin and veins; administration of medication by intravenous bolus; simulation of infusion technique; blood collection exercises with simulated blood; and simulation of clenched fist and tourniquet position. Comes with simulated blood concentrate, pressure bulb, blood dispensing bag, spare arm skin and veins, funnel, powder, instruction manual, smoked Lucite® base with stand; and soft nylon carrying bag. Combines all features required for IV, IM, and sub-Q training in one challenging simulator. Features: arm rotates 180° at deltoid region; subtle venous network in arm and hand; cephalic, basilic, antecubital, radial, and ulnar veins; realistic "pop" as needle enters vein; intramuscular injection site in deltoid area; subcutaneous injection areas on the volar side of the forearm and the lateral side of the upper arm; squeeze bulb to increase or decrease venous pressure; veins stand out or collapse; easily replaceable skin and veins; administration of medication byintravenous bolus; simulation of infusion technique; blood collection exercises with simulated blood; and simulation of clenched fist and tourniquet position. Comes with simulated blood concentrate, pressure bulb, blood dispensing bag, spare arm skin and veins, funnel, powder, instruction manual, smoked Lucite® base with stand; and soft nylon carrying bag. 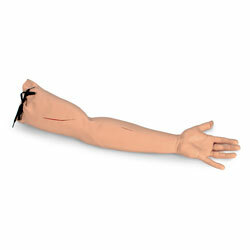 Lifelike, adult male arm reproduction with infusible arteries designed for training the proper arterial puncture procedure for blood gas analysis. Simulation of hand placement during performance of Allen's Test is possible. Flexible wrist enables proper positioning. Arterial pressure may be generated manually. Artery palpation is possible. Percutaneous puncture sites in both brachial and radial artery. Infusible arteries, with ability to pressurize system, enable blood backflow in syringe. Drain plug in deltoid of arm. Includes replacement skin and artery set, five syringes, blood concentrate, silicone spray, and carry case. The only Arterial/Venous Training Arm that provides both venous and arterial vascular access. An arterial pulse is generated at the radial and brachial locations through a peristaltic pump, providing truly realistic arterial stick and AV anastomosis/hemodialysis exercises. Conduct tests for A, B, O, or AB type blood. 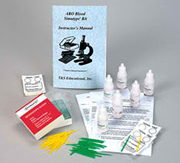 Kit contains: one bottle each of Anti-A antiserum, Anti-B antiserum; one bottle each of simulated blood samples; 50 Hema-Tags®; 50 yellow plastic toothpicks; 50 green plastic toothpicks; 72 glass microscope slides; instruction sheets; and 8-page instructor's manual. Complete for 50 students. Lifelike adult arm reproduction with multi-vein system designed for peripheral intravenous therapy. Venipuncture is possible in the antecubital fossa or dorsum of the hand. Rotation at deltoid for easier access during peripheral IV line insertion and removal. Accessible veins include median, basic, and cephalic. Palpable veins enable site selection and preparation. Infusible veins allow peripheral therapy with IV bolus or push injection method. 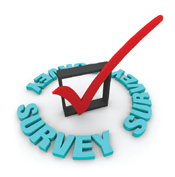 Intermittent infusion device insertion or conversion of existing IV line is possible. Peripheral IV line maintenance including assessment and rotation of site and dressing, solution, and tubing change. Includes replacement skin and multi-vein system (which ensure longevity of model), blood concentrate, blood bag with tubing and connector, clamp and hook, five syringes, silicone spray, and carry case. Features subcutaneous injection area on flexor and lateral sides of forearm, intramuscular injection capability in the deltoid area, dorsum of the hand has two veins for additional intravenous line set-ups, use for infusion and blood collection procedures, and allows administration of medication by intravenous bolus. Comes with set-up kit consisting of blood powder concentrate, pressure bulb, blood dispensing bag, and spare arm skin. Includes lucite stand and carrying case. The simulator features a forearm from the wrist to just below the elbow. Vinyl skin provides realistic feel and appearance to ensure a realistic training experience. The simulator features eight sites for practicing intradermal injections. If fluid is properly injected, a characteristic skin welt will form. The welt is removed by withdrawing the fluid after practice. Each site is reusable by dozens of students. Supplied with sealant, syringe and storage box. An adult lower torso reproduction with realistic anatomical landmarks and infusible venous and arterial systems designed for teaching femoral access procedures. Realistic palpable landmarks aid in site location: pubic symphysis, inguinal ligament, and anterior superior iliac spine. Arterial pulse may be simulated manually. Blood concentrate may be infused for realistic flashback upon cannulation of the venous or arterial system. Comes with five syringes, three IV bags with hoses and clamps, blood concentrate (one blue and one red), silicone spray, and carry case.